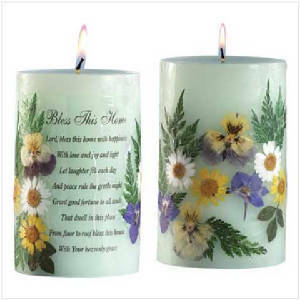 Featuring pressed flowers and a stirring poem, this candle brings a hint of apple cinnamon scent into your home. 60 hours burning time. 100% palm oil. Lead-free wick. Measures: 3 3/8" diameter x 5 1/4" high. 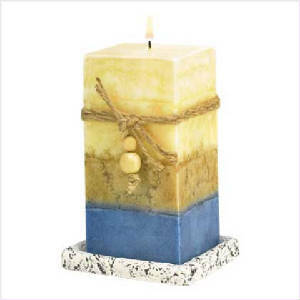 A tall, squared wax candle combines an attractive shape and bold bands of color for a naturally beautiful effect! Earthy hues and interesting textures give the appearance of layers of precious gemstones. A pleasing addition to any simple, sophisticated décor! Paraffin wax with plaster holder plate. Fresh Ocean scent. 4 diameter x 6 3/4 high. 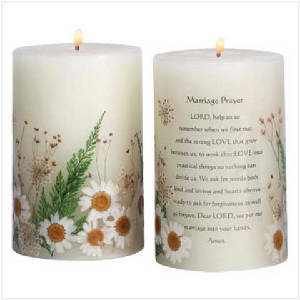 The marriage prayer graces this candle decorated in pressed daisies and baby's breath. Vanilla scent. 60 hours burning time. 100% palm oil. Lead-free wick. Measures: 3 1/2" diameter x 5 1/2" high.